Two people can drive at the same time. I lived in my old house on Longwood Drive for 11 years. It was a charming white New England colonial with green shutters, one of many adorable homes on a quaint tree-lined street that I still return to when I want a glimpse into that old life of mine. 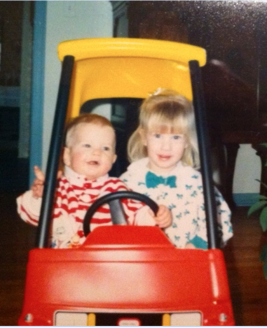 I have a million memories in that house, and when talking to my mom about this post, she called to mind memories that made up a funny trend: I loved to drive. First, it was Hot Wheels. My childhood area rug displayed a collection of tiny one- and two-story pastel-colored homes with colorful shutters and grassy yards — all connected by creamy-colored, two-way roads. From under my bed, I’d pull out my red plastic basket of Hot Wheels, and I’d cruise. On my side, with my head resting in the palm of my hand, I’d assist my favorite cars in reaching their destinations, from a carpooling adventure to picking up takeout. Then, it was my Little Tikes Cozy Coupe. I took that coupe for many a joyride around the basement of my old house. My mom laid Masking Tape on the floor, shaping roads and parking spots, intersections and driveways. I could even pull into the McDonald’s drive-through, where a kind employee handed me a Happy Meal free of charge (thanks, brother!). By the end of my busy day of driving, the McDonald’s — a beautiful plastic playhouse with a decorative roof and bright red front door — transformed into home sweet home. Later, it was my bike. As I grew older, my driving obsession graduated to my bicycle. I’d grab my faux set of car keys, a collection of oldies my mom put together for me, and I’d insert them in the ignition (read: the tiny space between the handlebar and the basket), and off we’d go. I’d start out on the right-hand side of my driveway, hit the “blinker,” making the sound with the click of my tongue, and then stop at the sidewalk-turned-intersection, obeying the rules of the road. My tendency to love driving certainly made me best-in-class when it came to competing against my brothers, playing Cruisin’ USA at our favorite pizza joint or Need for Speed on the PlayStation at home. When Grand Theft Auto came out in high school, I didn’t try to beat the Triads to graduate to the next level. I stayed on the right side of the road, avoided the prostitutes and gang members, and obeyed the rules of the road. It’s ironic I no longer even own a car (when I moved to New York, we sold my precious baby blue Chrysler Sebring I had since high school), but as a wise man once said, life is too short for traffic.